If you want reliable roofing services for your home or commercial property, we will work with you to come up with the right solution for you. You will get the perfect roof for your residence or business, as well as great customer service. Call us for a free estimate today! 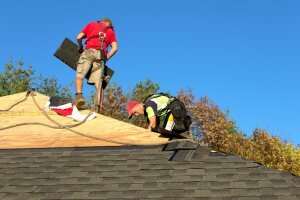 We have a team of licensed, bonded and insured roofers ready to give you the best repair and replacement services in the area. With over 40 years experience, we can help you make the right decision about the type of roofing services needed to protect your home or business from the elements. Call us now to get your free estimate! It is our belief that you receive the maximum return for every dollar you pay for roofing services, and we are committed to providing that to you! We offer you reliable services from a local, veteran-owned company, as well as free estimates on all of our services. We also give a 10% discount for all veterans. Our roofing contractors are second-to-none, and you are the one who benefits from our level of competence and service! Our roofers handle all residential roof types, and will be able to expertly care for your home, whether you have an asphalt shingle roof, metal roof, or wood shake roof. We use some of the best products on the market today to ensure you get maximum quality for your home. We will provide you with any roofing services needed to make your home the showcase of the neighborhood, call us now for your free estimate! We pride ourselves in providing the roofing services that will give you a quality product with expert workmanship, at a great value to you. We are passionate about taking care of our customers, and it shows! You will know you have a roof that will protect you and your family for years to come when you trust your home to our roofers! No matter what type of commercial property you own, if you are looking to repair or replace your current roof, or install a new one, our team of roofing contractors are here to do the job the right way. We can handle any and all types of roofing services for your building, including helping you get additional years out of it with a roof coating. Our fully licensed roofers are here to answer whatever questions you may have regarding our roofing services and what will work for you, just call! We provide you with yesterday’s quality workmanship combined with today’s high tech materials for the best return on your investment for years to come! We’ll get it done right, for less! 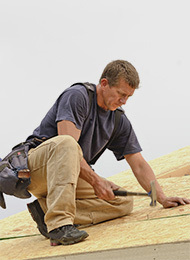 We offer all roofing services in Bentonville, Springdale, Fayetteville and nearby cities. We are a local roofing company that is veteran-owned and has over 40 years of experience in the business. We put our customers first, and always work to give you the most value for your budget. Call us today if you’re looking at making repairs or improvements to your roof!